We have so many different events both on and off the water. Here's a quick guide to what's what. There's a few different sailing races during the week. The Jolly Boat Challenge, Amory Cup are raced in competitors own boats. Entry forms are available from David Bayliss 07831 287887. The races usually happen on the first and last Sunday of Regatta week. The results from two days racing will be combined to give the overall winners. The Otter sailing takes place over two mornings or afternoons (tide dependent) in our own fleet of six Otter sailing dinghies. Boats are allocated for each race. There are rowing events for everyone - from experienced rowers through to novices! All races are rowed in Regatta dinghies with wooden oars. Many races are as 'singles' where one person rows the boat on their own. Some races are as 'pairs' where you row sitting side by side another rower using one oar each, this might be two ladies, two men or mixed. If a rowing event in the programme doesn't state whether it's 'singles' or 'pairs' then it's 'singles'. '2 pair oars' is two people rowing with two oars each sitting one in front of the other. For these races you must carry a cox on the stern seat. 'Back Water' racing is when the rower has to row the boat backwards! The 'Nags Race' is for bonafide partners - one acts as the cox and directs their partner who is rowing blindfolded! The Rowing Relay race for the Old Characters Trophy is a team of two men and two women who have to race in particular combinations around a designated course or between Teignmouth point and Shaldon beach. The Paddle and bottom-board race is for crews of six people paddling a regatta dinghy with paddles rather than rowing with oars! There are two different Seine Boat races during regatta week. On the Wednesday the racing is in the harbour and is for rowers who don't compete in the River Teign Rowing Club series. 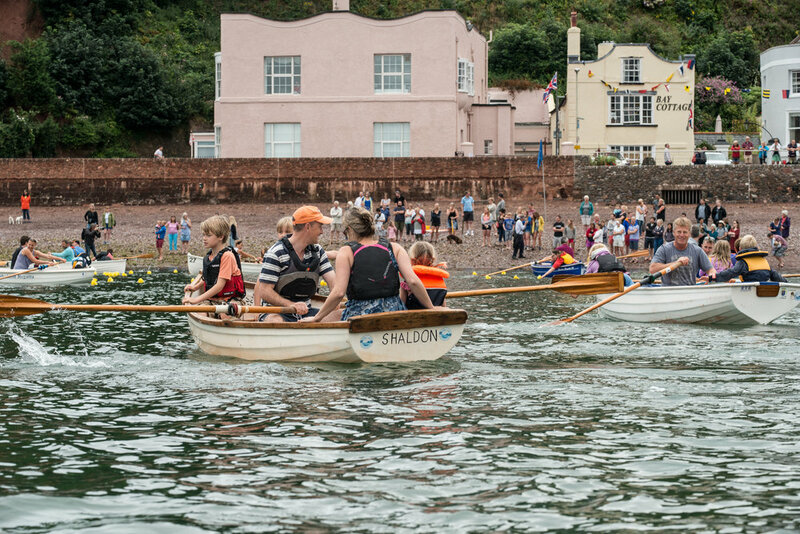 On last Sunday of Regatta week the Seine Boat racing is part of the River Teign Rowing Club Seine boat series of races that usually take place out to sea and finish in the harbour. As the name suggests this is a long distance row from Dawlish breakwater to Shaldon beach, although the course may be changed because of adverse sea conditions. This race kicks off the regatta each year and is rowed in regatta dinghies. It is fundamentally a 'pairs' race, two rowers rowing with one oar each although there are some people who row it on their own. It's a long race but there's always beers and pimms afterwards! We run eight sessions in the lead up to the Regatta so any child six years and over can come and learn to row in a fun but safe environment. All equipment is provided including boats, oars, gates and life jackets. Children are teamed with an experienced cox who shows them the ropes. Register on Shaldon Beach by the Ferry Shelter at 6pm each week. £1 per child per session. Come along and give it a go! Click here for more information. These are swimming races in the sea of different distances and age categories. The start of the race is standing on the beach, you swim out to a line held between two boats, grab a clothes peg and race back to the shore! Teams are made up of six players with at least three players under 12 years of age or all female. It's a knockout competition, played to Shaldon Rules and usually fiercely contested! You must register your team from the first Sunday of regatta week as entries are limited. Look at the programme for more details. Teams are made up of six players consisting of three men and three ladies or 13 to 15 year olds. It's a knock out competition. Winners in each round are decided by the best of three sets. The final match is the best of five sets. Register your team the first Sunday of Regatta as entries are limited! A new event to our regatta programme in 2017, it's already proved a huge success with some very highly contested matches! Teams of seven consisting of four adults and three aged 8-15 inclusive play to Shaldon rules. Entries are restricted and teams entered on a 'first come, first served' basis. Our newly purchased fleet of kayaks are raced over a short course in the harbour with a few buoy turns. We have a couple of different age categories for the kids - girls and boys under 11 years old and boy and girls between 12 and 16 years old - as well as the fiercely contested ladies and mens races. Just turn up on the beach, enter and have a go! Where else can you find the crazy combination of motor and rowing races?! Run down the beach, jump into the boat, motor as fast as you can to the first buoy, row to the next buoy and keep alternating around the course. A lot of fun and mayhem ensues! A great fun and mind bending treasure hunt by boat with clues taking you around the harbour and to both Teignmouth and Shaldon. It finishes in the Ferryboat garden for prize giving. Categories for under fives, five to seven, eight to ten, eleven to fifteen and for adults. Some of the creations people come up with are incredibly imaginative and creative. Just turn up on the beach with whatever you need to get building! A supposedly light hearted re-enactment of local history when the highly manoeuvrable but slower Shaldon punt used to compete with the larger, generally faster Teignmouth gig for the business of piloting ships into the harbour. Reliable historians assure us that the Shaldon punt regularly outmanoeuvred and outwitted the Teignmouth crew. Always entertaining to watch and equally fun to take part, a variety of beach sports from the traditional three legged and egg and spoon race to the wife or partner carrying race! There's races for everyone from the under three year old to the grandparents! The futility of trying to stop the tide, as King Canute demonstrated. Can you hold back the tide? Anything goes as long as you only use plastic spades. Some people stick to a good old fashioned sand wall, others build exploding volcanoes and desert islands with plastic palm trees! Another great event that draws the crowds! The best of three 'pulls' in each round. It looks a lot easier than it is! 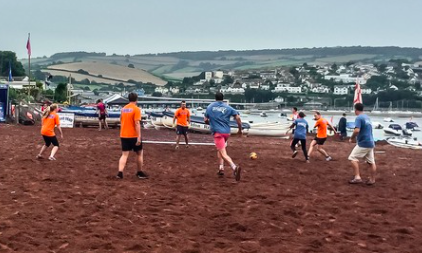 Played to Shaldon rules, teams of five that must include at least one female player at all times battle it out on the beach pitch. A knock out competition with each match lasting ten minutes and playing to the golden goal rule to find the winner in extra time if scores are drawn at full time. Yellow plastic ducks are trained up all winter ready for this race. The race starts at Pole Sands and finishes in the harbour mouth. Once the winner has crossed the finish lines regatta boats of children head out to collect the ducks and receive 5p per duck collected. 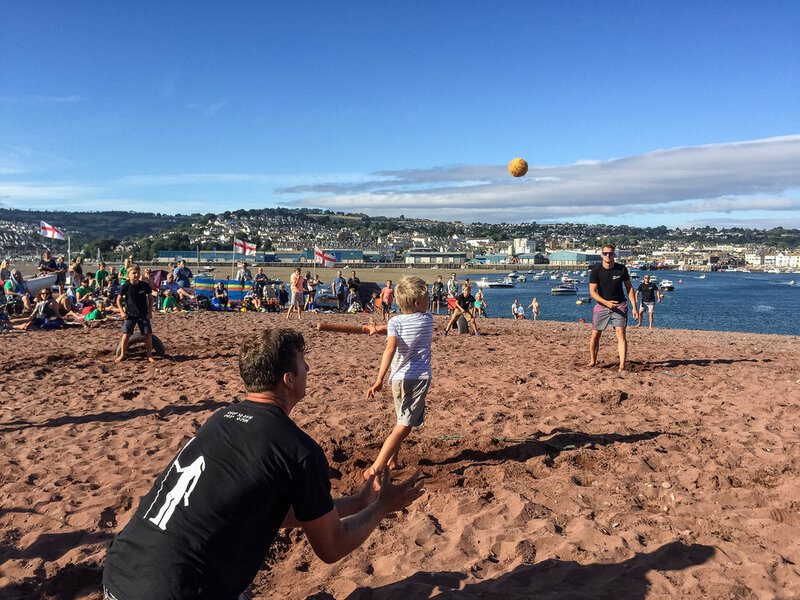 There aren't many cricket pitches found on the beach, but on the second Monday of Regatta there is on Shaldon beach! River fielding is strictly in rowing boats in this six-a-side knockout competition. Enter at your own risk! This event always draws huge crowds. Watch two people fight it out on a pole high in the air with two feather pillows! Or enter yourself!